Foreign aid? Are you kidding? Nope, the biggest single thing the federal government does these days is ... cut checks. Lots and lots and lots and lots of checks that go to individual citizens -- $2.3 trillion worth last year alone. 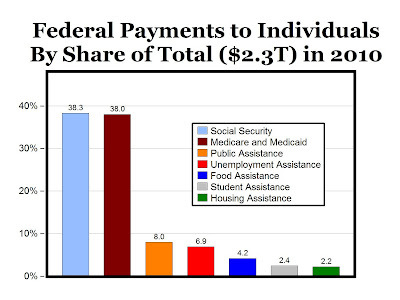 In fact, according to a table buried deep inside the little-noticed Historical Tables volume of the White House's 2012 budget, these "direct payments to individuals" accounted for more than two-thirds of federal spending in 2010 (see chart above). That's a post-war high. Where does all this money go? More than half goes to seniors through Social Security and Medicare. Only about 38 percent goes to the poor. And the rest of the payments end up with farmers, students, the unemployed, those looking for retraining help, veterans and other select groups." And the biggest of these direct payment programs -- Social Security, Medicare and Medicaid -- are also the fastest growing in the federal budget." 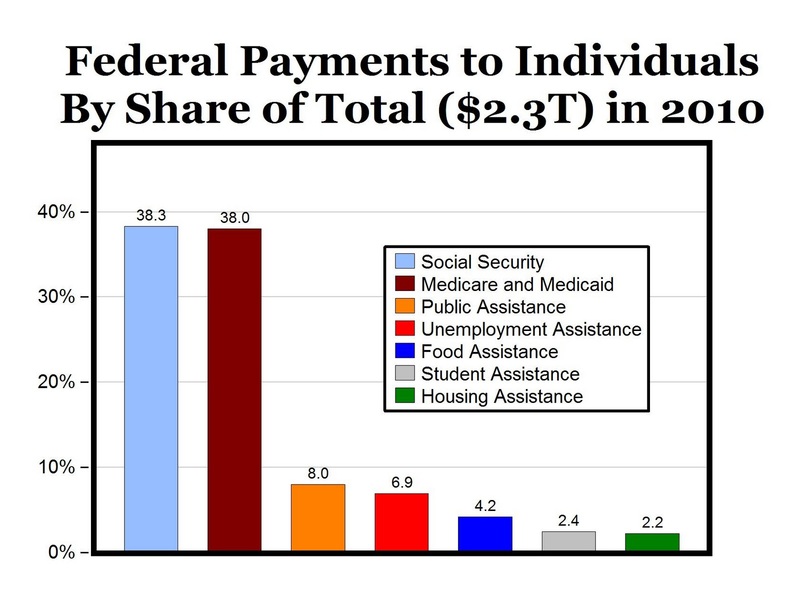 MP: The chart below displays a breakdown of the $2.3 trillion in payments to individuals in 2010 (from Table 11.3), and shows that more than 68% of payment are for Social Security and Medicare/Medicaid. 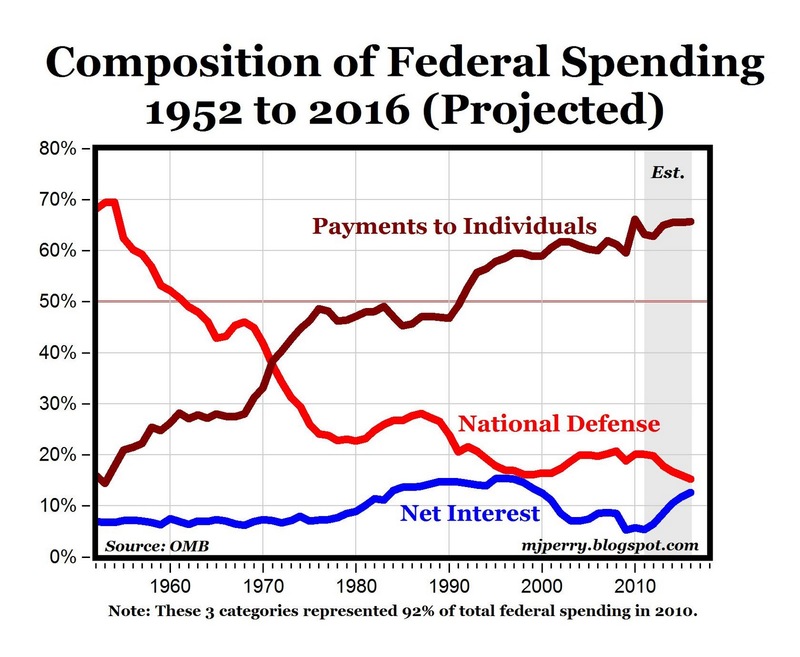 In John's article, he points out that at the same time that payments to individuals are rising, both in absolute terms and a share of total federal outlays, "the federal government increasingly relies on fewer and fewer taxpayers to cover its costs." "When you put these two trends together, what you find is that the federal government has over the years essentially turned into a gigantic wealth-transfer machine -- taking money from a shrinking pool of taxpayers and giving it out to a growing list of favored groups. But whatever your view, this situation will make getting the federal budget under control increasingly difficult, since it will invariably involve pitting those writing checks against those cashing them." 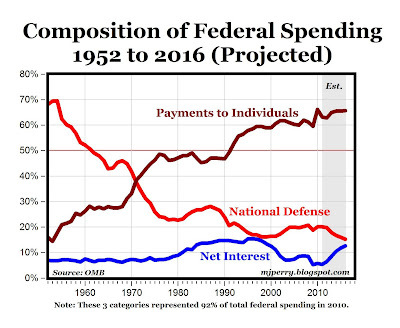 The Composition of Federal Spending Chart is so simply compelling it needs to be shown at congressional debates -- ASAP. Government does only one thing well, placing ordnance on a target. Everything else is either D or F performance. so what all do you suggest? throw all the old, infirm & unemployed under the bus? render them into livestock feed so the rest can eat better steaks? Good reason to switch to a Milton Friedman type negative income tax. Eliminate the bureaucracy, put more money in people's pockets and let individuals set their own federal benefit spending priorities. Pete Sepp of the National Taxpayers Union did some complicated mathematics and says, "By my reckoning, somewhere between 85 and 95 million households out of 115 million total have a smaller tax liability than the per-capita spending burden." The breadwinners for 18 to 26 percent of our households are shoveling coal in the engine rooms of the ship of state, while everybody else is a stowaway, necking with Kate Winslet like Leonardo DiCaprio in Titanic. Pete Sepp goes on to note that those breadwinners doing all the work are also less likely to be on welfare or receiving other government largesse and are more likely to have their Social Security benefits taxed. "If we were to compensate for this," he says, "I imagine that more like 100 million households have a smaller liability than the per-capita spending burden." One hundred out of 115 is 87 percent. Our nation is 87 percent mooch, 87 percent leech, 87 percent "Spare (hope and) change, man?" The country should've gradually shifted into private retirement and health care accounts long ago, which would've earned higher returns and then could've been taxed to help the poor, instead of creating more welfare jobs to redistribute more welfare. I agree that we should have switched to private retirement accounts ages ago. However, tax dollars will never be used to help the poor. the politicians are not in the business of helping the poor. Helping the poor doesn't pay. Helping the rich does. All we have to do is look to Greece to see our future, The statement is true, in socialism you do indeed eventually run out of other people's money. Farmers, students, and the unemployed are mostly poor, too. Let people set their own federal benefit spending priorities. Why stop there? Put a simplified budget on the tax form and let everyone designate where they want their money spent. Make the weighted average semi-binding: Congress can only deviate +/- 15%. Those breadwinners doing all the work? Give me a break. I know one of those guys. In his office there is a stack of paper on the floor, like a stack of magazines. I was shocked to see it was a stack of stock certificates 18 inches high. Yes, real stock certificates. I didn't know there was still such a thing. This Guy is a real reactionary, doesn't trust anything electronic. You are suggesting mandatory purchase of private company stocks? How is that different from mandatory purchase of health insurance? The problem with pulling back all the entitlements and redistributing them as tax cuts is that the people receiving entitlements have very little income to enjoy the cuts from. "You are suggesting mandatory purchase of private company stocks? How is that different from mandatory purchase of health insurance?" I don't recall reading the word mandatory, do you? "The problem with pulling back all the entitlements and redistributing them as tax cuts is that the people receiving entitlements have very little income to enjoy the cuts from." Whose fault is that? When those who DO get cuts spend the money that hasn't been taken from them as they wish at private businesses, those businesses will perhaps thrive, expand, and hire some of those who pay no taxes, and therefore deserve no tax cuts. Doesn't that sound more productive than simply handing other peoples money to those who haven't earned it? The comment was that we should switch to private accounts. Since social security is mandatory it seems reasonable that a switch would also be mandatory. Otherwise, the comment should have simply called for doing away with social security, if that was the intent. Who said anything about fault? All I'm pointing out is that the proposed "solution" solves a different problem. "so what all do you suggest? throw all the old, infirm & unemployed under the bus? render them into livestock feed so the rest can eat better steaks?" No. Thats the usual "emotional" response to such issues, which really doesn't even ask if these programs actually DO anything they're supposed to do (just as an example, try some math to figure out how much money is spend on welfare, and how much each welfare recipient gets. Now divide the money spend on welfare by the number of recipients, and see how the numbers add up). The first step, and possibly the only politically plausible step, would be to flatten the tax structure. Once everyone contributes, then everyone will have a stake in reducing these transfers. Those businesses will perhaps thrive. And perhaps they will hire some people who are not working now. And perhaps not. Maybe they buy a machine or hire someone in India. Then there are people incapable of work. Like I said, you are proposing a solution to a different problem, which is no solution to the one at hand, is it? You got some kind of majority in mind? Watch it evaporate when you cut off the checks. The tax structure ought to be as flat as the income structure. A flat tax wont do that. People I know who are on welfare have no other option, and no workable skills. I believe we are money ahead without such people in the work force. "I agree that we should have switched to private retirement accounts ages ago." The phrase is "private retirement accounts" These already exist in several forms, one popular one being 401k plans. The phrase "private retirement account" means "private". You own it, as opposed to "public", like the Social Security Ponzi scheme. If you "own" something, it is yours to do with as you wish. This means you can contribute or not contribute, as you please. I can't make it any clearer for you than that. The comment did NOT imply mandatory anything. Most people, when they say "we", mean "we the people". I understand your confusion, because when you say "we", you mean "the government". Those are not the same concepts, and you need to learn the difference. "Then there are people incapable of work." "People I know who are on welfare have no other option, and no workable skills. I believe we are money ahead without such people in the work force." As has been suggested to you many times, if you are concerned about people who need help in your community, YOU spend YOUR money helping them, in any way you see fit. I will do the same in my community. Private charity is the answer, not wasteful, ineffective, government spending using money ripped out of everyone's pocket. Well rjs remember the movie Soylent Green? It is not deniable that the government transfers money from the productive class and gives it to the poor. While we can debate if this dependency is really 'helping' the poor it cannot be denied that they get something that they did not earn but the higher income individuals who paid the taxes did. It isn't. In both cases you have someone advocating the use of force to oblige individuals to do something that they would not choose to do voluntarily. Not at all. Because you prefer emotion to logic you are missing what is important. In the absence of a massive government bureaucracy there would be fewer poor old people and we would have far more resources to help those that need charity. As they were in the past, most people would be protected by the mutual societies that they belonged to and their pool of savings, which was protected from a decline of purchasing power by a link to a commodity that restrained governments and central banks. In the absence of intervention bad economic decisions would be punished by the markets so people would take far fewer reckless risks by speculating in areas that they knew nothing about. They would not depend on unfunded promises made by social programs that are running massive deficits and would ensure that they took steps to protect themselves by having savings. With less government meddling with the money supply businesses would have a much better idea of what the market cost of capital was and would have a better opportunity to plan properly. Instead we have social programs on the brink of insolvency as currencies are dying and people have little in the way of true savings to ensure that they survive the tough times. Emotionalism and pandering to power have created a mess that requires serious action to be taken by serious people who have no incentive to do the right thing. "The tax structure ought to be as flat as the income structure. A flat tax wont do that." i cannot even figure out what you are talking about here. if you want a tax structure that mirrors income, than a flat tax is exactly the way to do it. make $100 pay 20, make 1000 pay 200. that is prefect alignment with income. so what on earth are you talking about? this is a foolish straw man augment. allowing individuals to save (or not) for their own retirement is hugely advantageous. not only does it take a crushing burden off the government, but it also takes savings out of the non productive hands of the government and puts it into productive use through investment. this drives economic growth and also provides more savings as the returns are much higher than the negative nominal (much less real) returns that the SS "trust fund" gets. this means that you can invest what you pay to SS and have more to retire on (likely 5-9 times more) or invest less, have more to live on, and still retire with more money. so, no more SS tax, take the money currently available, pro rate it out based on age and contributions, and be done with it. SS has done more to make it difficult for americans to retire comfortably than any other force in history. time to put that 12% back where it belongs in the productive sector. the dead hand of government has done enough damage. oh, and before someone makes the silly claim that "personal investment is risky", take a look at the negative annual returns (nominal) of social security. the take a look at the dow. if you start work at 25 and work to 65 that's 40 years. show me any 40 year period in which the stock market did not make you money. if you retired in 1929, right after the crash, you were still up 100% over 40 years. if you bought the day before the crash in 1929, you retired in 1969 up 300-400%. if you liquidated all your funds from 40 years on the day of the low in 2008, you were still up 600% from 1968.
so spare me the "the stock market is too risky" stories. you cannot possibly pick dates 40 years apart that don't outperform the existing system by 2-300% +. I do not believe that he knows what he is talking about. Little that he writes makes sense and what does often contradicts previous claims. That is not the argument used by our progressive friends. Instead of arguing about overall returns they will tell you that people are too stupid to look after their own investments. They will stay away from perceived risk until after an asset class has had its run and will get into it just before the crash. They won't wait 40 years but will choose instead to pull out their money at the bottom and will keep repeating the mistake until they go broke. Their alternative is to have smarter people handle the investment decisions for the individual making the contribution and forcing the funds to stay put. That way the loss is much smaller and you get back $0.80 for every $1 you invested. I would like to know how much is collected in payroll taxes for Social Security and Medicare. We talk about those being the biggest government expenses, but that is only because all the collected monies go into the General Fund. How much is actually collected by the Payroll Taxes? 2010 total expenditures = $712,526 millions of which $701,609 was benefits. Remainder was admin expense and railroad retirement expense.